Before I talk about my own troubles, let me tell you about another book, “Computer Game Bot Turing Test”. It's one of over 100,000 “books” “written” by a Markov chain running over random Wikipedia articles, bundled up and sold online for a ridiculous price. The publisher, Betascript, is notorious for this kind of thing. This would just be an interesting anecdote, except that bot activity also seems to affect books that, you know, actually exist. Last year I published my children's book about computer science, Lauren Ipsum. I set a price of $14.95 for the paperback edition and sales have been pretty good. Then last week I noticed a marketplace bot offering to sell it for $55.63. “Silly bots”, I thought to myself, “must be a bug”. After all, it's print-on-demand, so where would you get a new copy to sell? Then it occured to me that all they have to do is buy a copy from Amazon, if anyone is ever foolish enough to buy from them, and reap a profit. Lazy evaluation, made flesh. Clever bots! Then another bot piled on, and then one based in the UK. They started competing with each other on price. Pretty soon they were offering my book below the retail price, and trying to make up the difference on “shipping and handling". I was getting a bit worried. My reaction to this algorithmic whipsawing has settled down to a kind of helpless bemusement. I mean, the plot of my book is about how understanding computers is the first step to taking control of your life in the 21st century. Now I don't know what to believe. It's possible that the optimal price of Lauren Ipsum is, in fact, ten dollars and seventy-six cents and I should just relax and trust the tattooed hipster who wrote Amazon's pricing algorithm. After all, I no longer have a choice. The price is now determined by the complex interaction of several independent computer programs, most of which don't actually have a copy to sell. 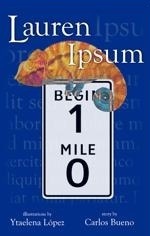 Update, 29 Feb: The Goodwill Industries of Greater Nebraska has jumped into the ring, offering a used copy of Ipsum for $12.18. I believe this one. It mentions that their copy is signed by both me and the illustrator. We sold about 250 signed copies during our Kickstarter campaign, and 2 or 3 went to Nebraska. Like what you read? Lauren Ipsum is a children's story about computer science. Buy a copy, and you'll be helping us translate it into Spanish, Portuguese, and other languages.